The patented SportClip stays in your ear no matter how rigorous your routine, while super comfortable ear pads seal in your sound. iSport Intensity is safe for outdoor sports like running and biking. You Move, iSport Intensity Stays Put. This is pure audio adrenaline. Repeat to end the call. Decline an incoming call: Press and hold the center button for two seconds, then release. Play or pause a song or video: Press and release the center button. Monster NCredible NTune On-Ear Headphones. A variety of colors that will bring your music and style to life! N-TUNE headphone's slick on-ear design with thumping bass take's yoursound up to a whole new level. 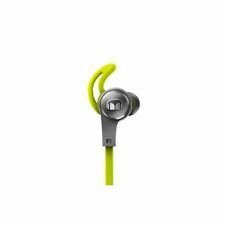 1 X MONSTER iSPORT INTENSITY IN-EAR NOT-WIRELESS HEADPHONES WITH IN-LINE REMOTE & MIC. 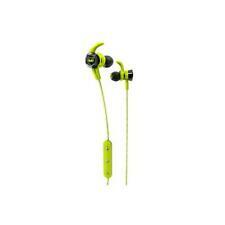 PART CODE: Monster iSport Intensity In-Ear Headphones With In-line Mic & Remote. You Move, iSport Intensity Stays Put. Monster iSport Compete In-Ear Headphones . Condition is New. Dispatched with Royal Mail Signed For® 2nd Class. The wireless iSport Freedom lets you seamlessly run or hit the gym while taking calls and listening music. Tough, durable and waterproof, iSport Freedom stands up to your most rigorous workouts. Freedom from wires. 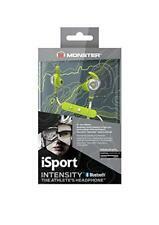 Monster iSport Achieve In-Ear Headphone - Green. Condition is New. Never used or taken out of the packaging Dispatched with Royal Mail 1st Class. Monster iSport Achieve In-Ear Sport Headphone - Used / Black and White. Dispatched with Royal Mail 1st Class. Genuine Monster ™ iSport Compete In-Ear Sport Headphones. Do you need a little more from your wired sports headphone?. 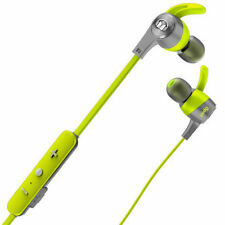 Then look no further than iSport Compete, the ultimate wired sport in-ear headphone. Green Monster Headphones. Condition is Used. Dispatched with Royal Mail 1st Class. Please note that it does not come with the plug in wire, as I have lost it, sold as seen, only used a few times! PERFECT REPUTATION. NEVER be afraid to ask for a lower price! you might just pick up a bargain if you ask. Monster N-Tune™ ON-Ear Headphones - Matte Green. Range Extenders. In the case of goods such as earrings, body jewellery & personal grooming products that have hygiene seals, you must exercise reasonable care by not removing the seals when examining them. 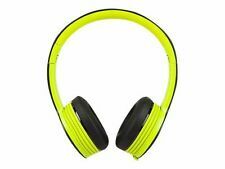 Monster iSport Freedom Wireless Bluetooth on Ear Headphones - Green. Condition is Used. Dispatched with Royal Mail 1st Class. 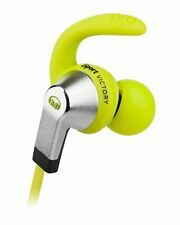 Monster iSport Victory In-Ear Only Headphones - Green Apple.Sealed. 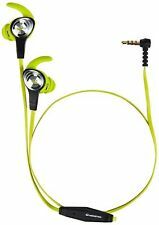 Monster iSport Victory In-Ear Bluetooth Wireless Headphones - In-ear wireless - Green. 8 hour battery life. 2 sound profiles - Normal & Turbo. Bluetooth 4.0 with apt-x. 24-hour battery life. Sweat-proof and washable. Monster Clarity HD In-Ear Headphones with Microphone – Neon Green. Monster Clarity HD In-Ear Headphones with Microphone. Trash those generic models and step up to Monster’s thoughtfully designed, incredible-sounding Clarity HD high-performance earbuds for an affordable, exceptionally comfortable and sonically superior high-definition audio experience. Genuine Monster iSport Intensity In-Ear Only Headphones. The headphones is in excellent condition and perfect working order. 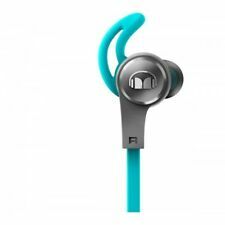 The Monster iSport Achieve In-Ear Headphones are specially designed for use in exercise and fitness. The Sound Monster sound insulation makes the sound even better and of the best quality. This also ensures that they do not fall out of your ears during your exercise routine. This is a great headphone for working out at the gym, with exclusive Monster SecureFit that lets you move freely, yet still stays put. SecureFit™ SportClip stays in your ear. Tangle-resistant cable. Convenient right angle connectors. You Move, iSport Intensity Stays Put. Real champions keep pushing – breaking new barriers and setting new records. And Monster gives you the ability to do just that with the iSport Compete. The secure fit of the iSport Compete gives you 90% noise isolation. Its advanced in-ear speaker and MicroStrand conductors turn your tunes into pure audio adrenaline. Monster Headphones. Amazing pure monster sound. Patented SportClip stays in your ear. And Monster gives you the ability to do just that with the iSport Compete. The secure fit of the iSport Compete gives you 90% noise isolation. The iSport range is fully sweat proof so you don’t have to worry. You Move, iSport Intensity Stays Put. Repeat to end the call. Decline an incoming call: Press and hold the center button for two seconds, then release. Play or pause a song or video: Press and release the center button.